Finding a gem in a bed of stones as they say "one in a million shot". Just in time after searching and viewing for days I found a site that has the right anniversary gifts that I'm looking for. I couldn't believe how many different types of roses they offer. Each of different material for different years of your anniversary. I've never seen this before. The wedding anniversary gifts by year is so unique. I've also sent this out to my many girlfriends that always have a problem picking the appropriate item for their anniversary. 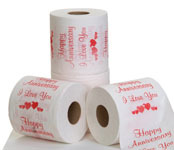 I had such a laugh at the happy anniversary toilet paper. My husband was looking over my shoulder and happen to notice the sweet sixteen category. As I clicked there it brought up beautiful purple roses. His daughter's favorite. Next year he plans on surrounding her with these for her birthday.